Lumière was an important French film maker from 1893 until they were absorbed by the Swiss Ciba in 1961. In 1982 the company became Ilford France. It was founded by Charles Antoine Lumière (1840-1911). His sons Auguste and Louis Lumière were the first who made a presentation of a modern kind of movies. With their movies they won fame as cinematography pioneers, but didn't stay in that business. In the early 20th century they developed a new photographic process, a "procédé de photographie en couleur" (patented 1903), the most successful color process of its time. They began to produce Autochrome color plates (actually monochrome plates combined with a three-color filter screen) for that process, and continued until the 1930s, adding sheet and roll film using the same process. They made cameras from the end of the 1920s to 1961. 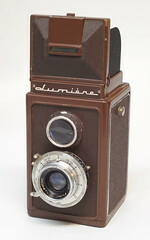 Around the year 1970 cameras were sold with the Lumière name, but they were not designed or made by the company. ↑ Lumière 35 mm film La Cigare Introuvable of about 1897, sold at the 22nd Westlicht Photographica Auction, on 24 November 2012. The film has perforations on each side, one circular hole per frame. A contemporary projector made by J. Carpentier of Paris, to the Lumières' design, was also sold at the same auction. ↑ The Lumières' patent at Autochromes Lumière. Vial, Bernard. Histoire des appareils français. Période 1940–1960. Paris: Maeght Éditeur, 1980, re-impressed in 1991. ISBN 2-86941-156-1. This page was last edited on 5 March 2018, at 06:12.